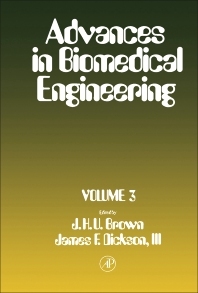 Advances in Biomedical Engineering, Volume 3, is a collection of papers that discusses circulatory system models, linguistics in computer usage, and clinical applications on patient monitoring. One paper describes the use of comparative models of overall circulatory mechanics that include models of the cardiac pump, of the vascular systems, and of the overall systems behavior. Another paper describes a model in processing medical language data that employs an explicit semantic structure, becoming the basis for the computer-based, artificial intelligence of the system. One paper cites studies by Weetal (1970), Anderson and co-workers (1972), and Martin and co-workers (1971) of the possibility of using biopolymers as biomaterials in artificial kidneys and blood oxygenators. Another paper describes a system for regionalization of special laboratory and data services, the integration of laboratory data acquisition and data management, as well as the incorporation of a centralized computer configuration for hospital administrative functions. The collection can prove valuable for biochemists, bio-engineers, chemical engineers, and investigators/technicians whose works involve biomaterials research.